Since announcing our Advancing Solutions program in June 2017, our team has worked with state and local democracy reform campaigns across the country to help reclaim political systems for the people. MapLight provides resources and assistance to campaigns promoting policies such as public funding of elections, transparency laws, contributions limits, and more. We have provided data analysis, policy and messaging guidance, and public education to the Oakland Public Ethics Commission, SF Friends of Ethics, Common Cause New Mexico, the Washington Democracy Hub, and others to promote democracy reform in their respective jurisdictions. Earlier this year, MapLight published “Bringing Fair Elections to Berkeley,” a resource for activists that draws on our own staff’s experiences in leading the successful 2016 Berkeley Fair Elections campaign. Berkeley Fair Elections: In 2016, MapLight staff volunteered on the successful ballot measure campaign to create a small donor matching system in Berkeley, California and helped make the case for reform by publishing a data analysis of campaign contributions in Berkeley elections. Our analysis showed that candidates for mayor and City Council received more than half of their campaign funding from less than one percent of Berkeley households, that candidates who raised the most money tended to win, and that local races cost tens to hundreds of thousands of dollars—but tended to be uncompetitive or favor incumbents. Our analysis convinced key local influencers to endorse the measure and persuaded the public that campaign finance was an issue to care about at home. The measure passed with 65% of the vote. We are currently working with the city on the implementation of the law and public education efforts once it goes live. Washington State: MapLight is partnering with the Washington Democracy Hub, a project of Win/Win Network, to provide research on state- and county-level campaign finance indicators for a report on the health of democracy in the state. This report will be used by a coalition of 50 advocacy groups to identify opportunities to improve state and local law. In the future, depending on its utility and success, this report could serve as a template for organizers in other states. Oakland Public Ethics Commission: The Oakland Public Ethics Commission is currently considering ways to improve or replace its limited public financing system. Last fall, MapLight developed a presentation on campaign finance trends in Oakland for the Commission, charting candidate fundraising patterns and mapping donor demographics to illustrate the need for reform. We found that 93% of contributions in the 2014 and 2016 elections combined came from less than 1% of the city’s population and that political giving is concentrated in high-income, majority-white zip codes. 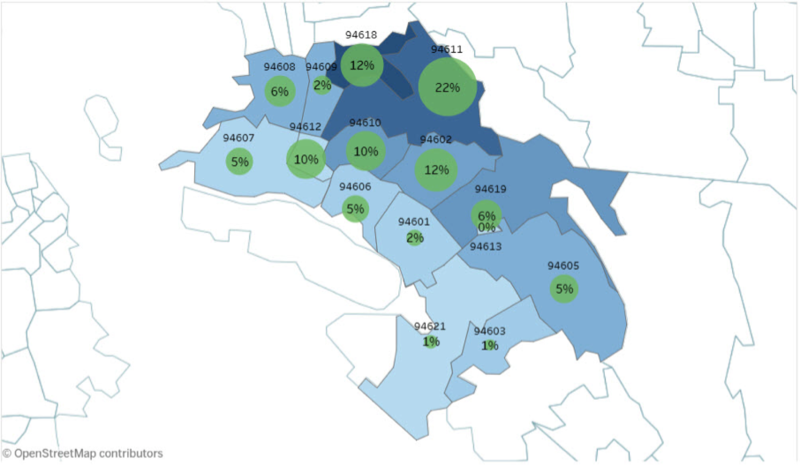 In Oakland, MapLight demonstrated that contributions are concentrated in wealthier parts of the city. San Francisco: MapLight worked with SF Friends of Ethics, a local watchdog group, to help the San Francisco Ethics Commission reform pay-to- play and other ethics rules. To support a rule banning commissioner contributions, we analyzed political contributions by city commissioners. In addition, we provided data on campaign contributions by entities seeking city permits. Our data was presented to the Ethics Commission for consideration. Albuquerque: MapLight is working with Common Cause New Mexico and other organizations to pass a “democracy dollars” public financing system in Albuquerque, New Mexico, similar to the voucher program being implemented in Seattle. So far, we've provided the campaign with a summary of how much money candidates for City Council and mayor have historically raised and spent, which will inform policy design and messaging. We have received more requests for assistance from reform advocates than we are able to fill at our current capacity. We are currently seeking dedicated funding to expand our work to help state and local groups achieve more equitable elections and more responsive governments.